Running is an easy sport to get into, as you only need a pair of runners, some fitness clothes and you’re ready to go running around the block, at the park or at the gym. One thing that is very important to consider when running or when deciding to increase distance, is to start with short distances and gradually increase your running distance with time. Doing too much too soon is a major risk for injury. Injuries can include; shin splints, knee pain, stress fractures or muscle tendinopathies. 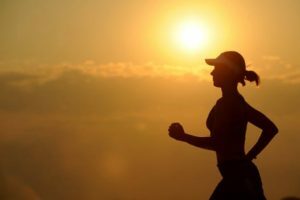 It is natural to get some muscle pain after each run but it is important to distinguish the bad pain from the good pain, this should not be ignored. It is important to warm up and stretch before walking and running. If you are new to running, it is important to start by walking and building up fitness. Once fitness is increased, running can begin with short distances and should be increased by 10% each week. If you feel it is too much for you, then stay at a steady distance for a longer period of time until you are ready to increase it. If you notice any pain and discomfort, your body will tell you and it is time to reduce your distance. If you wish to get some advice on any foot related issues. Don’t hesitate to visit us at PodiatryHq. Our friendly staff are waiting to take your call on 8645 9888.